This is a very common method of construction used in construction and manufacturing and is also widely used in the manufacture of trailers. The item is manufactured including the necessary cutting and welding and then given several coats of paint to protect against corrosion and to improve the appearance. This method is economical and is ideal in situations where corrosion is not a major problem. It is perfect for trailers in constant use or trailers that are garaged and not used on beaches or in corrosive environments. 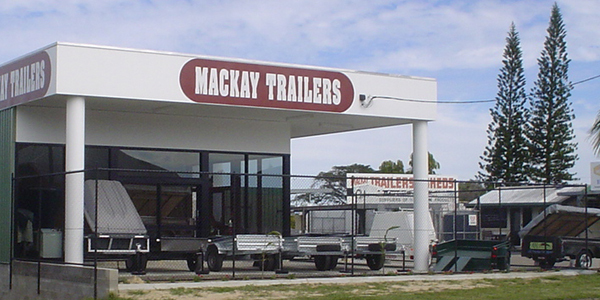 Trailers can be made from zinc sheeting and zinc coated box sections. The zinc sheeting typically has a grey colour due to the alloy containing a small amount of iron. The alloy is harder than pure zinc so resists scratching better than pure zinc. We recommend zinc for your trailer if you intend to signwrite it or if you require it to be painted white. The zinc will help prevent rust stains developing at the site of the inevitable stone chips. Unfortunately as the zinc is lost everywhere the steel is cut or welded, the zinc will do very little to prevent rust in a corrosive environment. The places where the rust usually starts is where the cut edges and welds are and the paint can't reach. Some protection can be gained by oiling joins, but for prevention of corrosion it is essentially the same as a black steel painted trailer. We believe in most cases it is better to invest in a stronger structure than waste money on zinc. It is possible to use galvanized steel. Steel sheet or box sections can be hot dipped galvanized with a thin shiny coat of zinc by the steel supplier. Small manufactures often use this method. Again all cuts and welds have lost protection and need to be protected by cold gal or paint which does not give satisfactory protection. We do not recommend this method when there is better available. This is the construction we recommend for trailers used in corrosive environments such as on beaches or in backyards in Mackay. All possible welding and cutting are completed then the whole trailer is dipped in a bath of zinc at 450 degrees Celsius. The zinc penetrates all joins and the interior of all box sections and tubes and forms an alloy with the surface of the steel . The end result is the steel is protected by a hard zinc iron alloy similar to zinc sheeting mentioned above plus a thick layer of zinc. As the coating is far thicker than that on zinc or galvanized sheeting the protection is far better plus the galvanizing has reached all the places where protection is needed. All boat trailers should be made by this method. Hot dipped galvanized trailers may be painted but usually aren't. A new method of constructing trailers is to use a Polyethylene body with a zinc or galvanized steel chassis. Polyethylene can't rust and is light so for some uses this is the ideal construction.